Said to have a cricket backdrop, Nani’s Jersey has been captioned – Its never too late to dream – hinting that Nani would be portraying an aspiring cricketer in the film. Actor Nani is currently shooting for his upcoming multi-starrer with Akkineni Nagarjuna which is being directed by Sriram Aditya. Said to be a comedy genre, the film is yet to be titled and will have Nani playing a doctor in it. Nani will next team up with young filmmaker Gowtam Tinnanuri who shot to fame with Malli Raava. Nani has now revealed the poster of the film which has been titled Jersey. Said to have a cricket backdrop, Nani’s Jersey has been captioned – Its never too late to dream – hinting that Nani would be portraying an aspiring cricketer in the film. The title poster of Jersey has created quite an excitement amongst Telugu movie buffs. 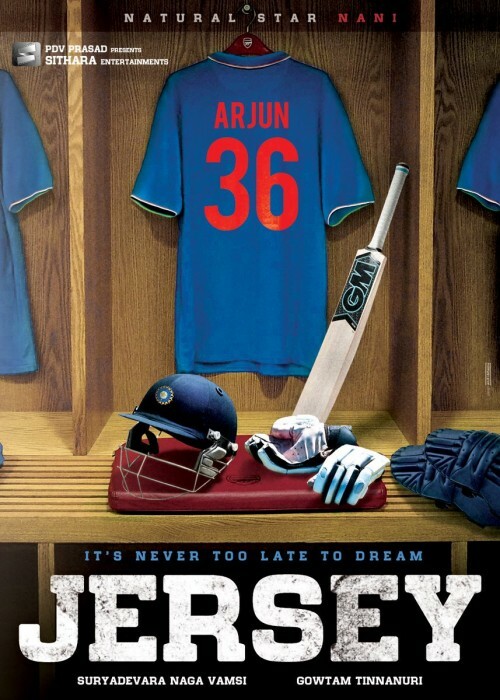 Jersey is being produced by Sithara Entertainments and more details about the film are yet to be revealed by the makers. Nani is known for encouraging new talent in the industry and has proven that many a times. Nani had recently produced a film AWE which was directed by Prashanth Varma. Starring Kajal Aggarwal, Nithya Menen, Eesha Rebba, Regina Cassanadra and Murli Sharma in lead roles, AWE was one of the most acclaimed films in 2017. Nani was commended by audiences and his colleagues from the film industry for encouraging new talents without any inhibitions. Jersey will be written and directed by Gowtam Tinnanuri who shot to fame with Sumanth and Akanksha Singh starrer Malli Raava. A breezy romantic tale, Malli Raava was one of the runaway hits of 2017 and garnered a lot of attention. Nani, on the other hand, is also hosting the second season of Bigg Boss Telugu which started off a week ago on June 10. While the first season was hosted by Jr NTR and was a terrific hit, expectations are quite high on Nani to live up to the standards set by Jr NTR in the first season.